The September jobs report wasn't great, but stocks rose Tuesday as investors anticipated that lackluster hiring will push the Federal Reserve to keep its monetary stimulus as is in the months ahead. The Dow Jones industrial average, S&P 500 and the Nasdaq ended modestly higher, with the S&P 500 closing at a fresh record high for a fourth straight day. 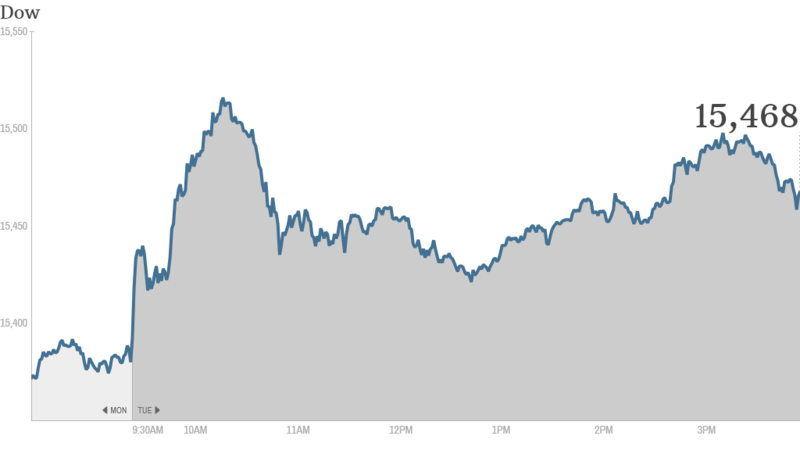 The Dow finished at its highest level in a month. The jobs report, which was delayed more than two weeks because of the government shutdown, showed the economy gained just 148,000 jobs last month. But the unemployment rate ticked down to 7.2%, the lowest since November 2008. Still, the numbers suggest that the U.S. economic recovery remains fragile and that the Fed will likely keep buying $85 billion in bonds each month for a bit longer. In light of the "moderate tone" of the jobs report, Barclays economist Michael Gapen said in a note to clients Tuesday that he now thinks the Fed will wait until March 2014 to scale back, or taper, its bond buying program. He had previously expected the Fed would taper this December. The Fed has repeatedly said it wants to see more improvement in the job market before it begins to cut back on its $85 billion a month in bond purchases. Plus, economists expect the Fed will want more data on how the shutdown impacted the economy before it will be ready to start tapering. Earnings keep rolling in: Netflix (NFLX) reported strong quarterly earnings and a rosy outlook late Monday. Shares initially surged to an all-time high in early trading, but quickly fell into the red. The stock finished down more than 9%. Netflix shares have been on a tear all year, up nearly 250% so far. But Netflix CEO Reed Hastings said he isn't comfortable with the huge run-up. On a post-earnings conference call with analysts, he said Netflix thinks "momentum investors" are "driving the price more than we like normally" -- but that it's out of the company's control. StockTwits user keywestbidwacker said Hasting's comments should be a red flag for investors. "$NFLX never own a stock that a CEO talks down... not shareholder friendly at all... crazy...," he said. Others suggested that investors who have profited from Netflix's significant advance may be starting to take money off the table to rake in some profit, including billionaire investor Carl Icahn. "$NFLX Perfect example of not looking a gift horse in the mouth," TechTrader17 said. "I bet Icahn finally took some skin out of the game too." Delta (DAL) shares jumped after the airline reported quarterly profit growth. Lockheed Martin (LMT) shares rose after the aircraft manufacturer reported a jump in quarterly profit, year over year, and increased its full-year outlook. The good news came despite the government shutdown, which led Lockheed and other defense contractors to furlough some workers. 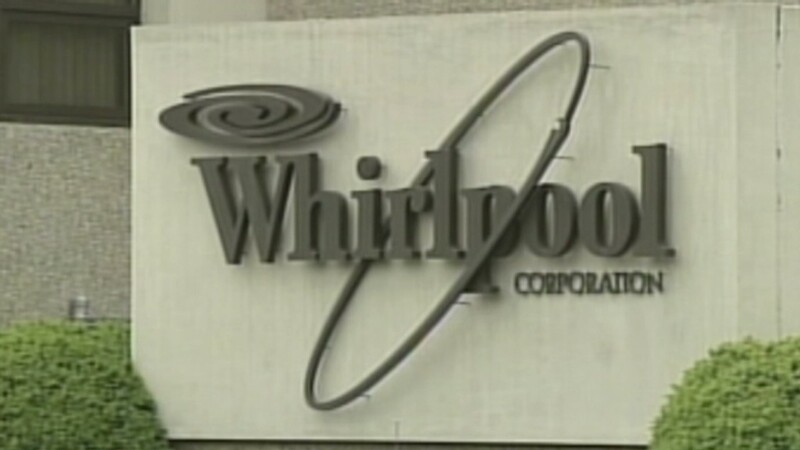 Whirlpool (WHR) shares rallied after the home appliance giant reported a third-quarter profit that doubled from a year ago and boosted its outlook for the year. Tablet-palooza: Apple (AAPL) was in the spotlight after it unveiled the iPad Air, a new lighter and thinner version of its tablet. The iPad Air will hit shelves Nov. 1. The company also announced a new iPad mini. But investors appeared to be unimpressed. Apple shares finished modestly lower following the announcement. Nokia (NOK), which is selling its device business to Microsoft (MSFT), unveiled its first full-size tablet and a pair of big-screen colorful Lumia smartphones earlier Tuesday. Shares of Nokia were also up after Dan Loeb said his hedge fund Third Point purchased a stake in Nokia during the third quarter. In a letter to clients, Loeb said he made the purchase after the sale to Microsoft was announced. "Here come the activist investors! $NOK," said StockTwits user CS917047. One trader said he expects Loeb's position could help drive shares of Nokia up 10% in the coming weeks. "$NOK Now everyone is positive except some early bargain hunters who are exiting like Nordea," said mecka. "Dan Loeb will take it to $8 in few weeks." European markets closed with modest gains. Asian markets ended the day mixed. Stocks in Hong Kong fell after a weak earnings report from China Mobile (CHL), while Japan's Nikkei inched higher.